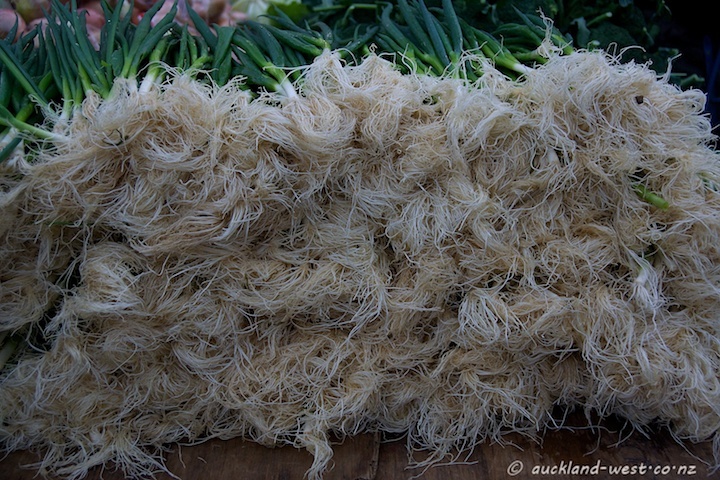 The CityDailyPhoto theme for September is “Open Air Market”. Click here to view thumbnails for all participants. My regular Wednesday theme of painted boxes will resume next week. 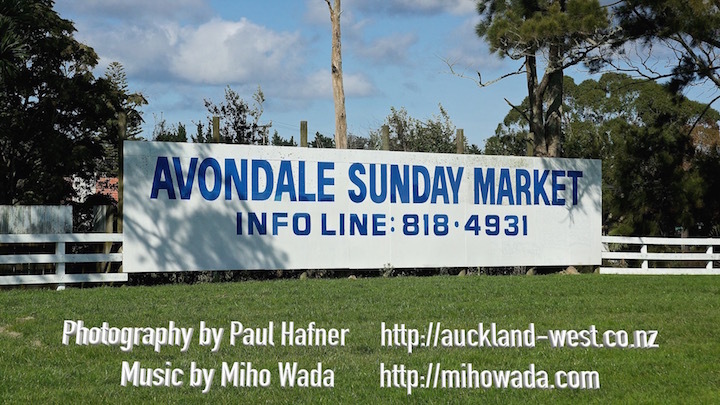 My choice is the Avondale Sunday Market, which attracts up to 20,000 people to Ash Street, Avondale, in the grounds of the Avondale Racecourse. Buyers and sellers of many different ethnicities make this a colourful affair. Not to mention the goods on offer, from produce to fresh fish, DVDs to bric-a-brac, food stalls (“we have more than enough food venders on the grounds sorry” says the website, deterring any new would-be food merchants) and coffee carts, tools and garden plants, flowers, and, and, and… Above is a round-up of last Sunday’s pictures. 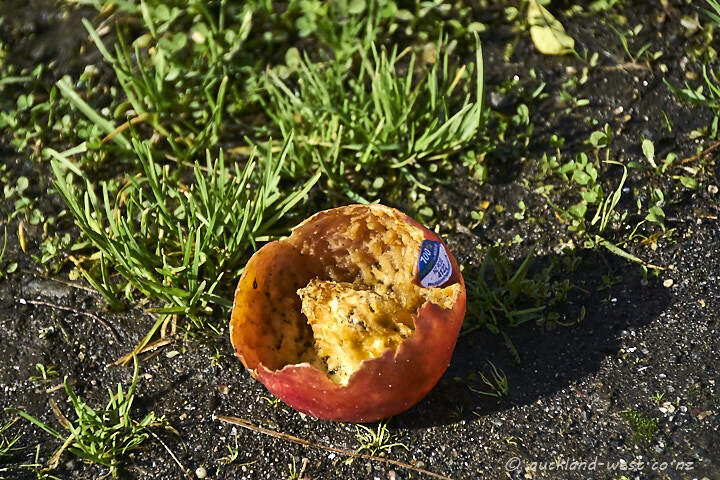 Of course there were earlier posts from this market on this blog. 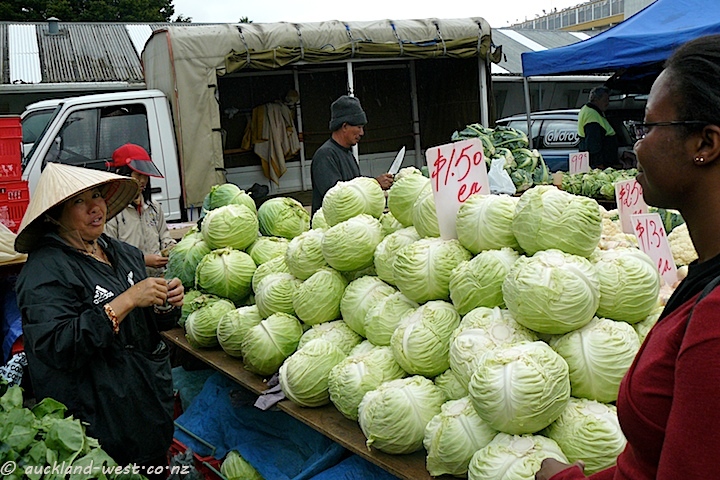 Maybe no kings at the Avondale markets, but plenty of buyers and sellers. 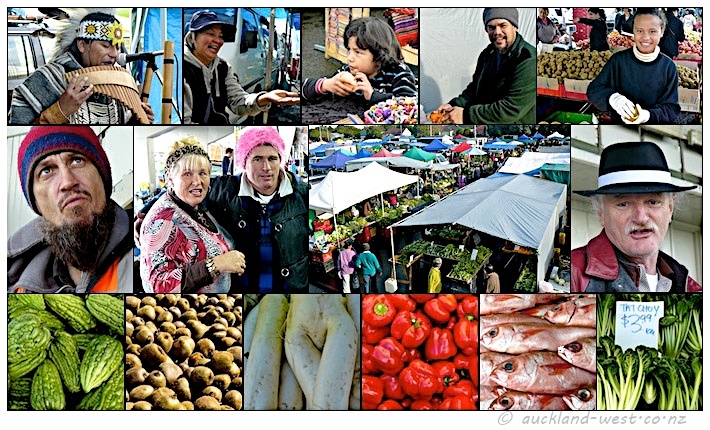 Avondale Market takes place every Sunday without exception, from early morning to about 2 p.m. Fruit, vegetables, preserves, fish, bric-a-brac, clothes, plants and much more, together with food stalls, attract large numbers of people of all nationalities to Ash Street, Avondale. 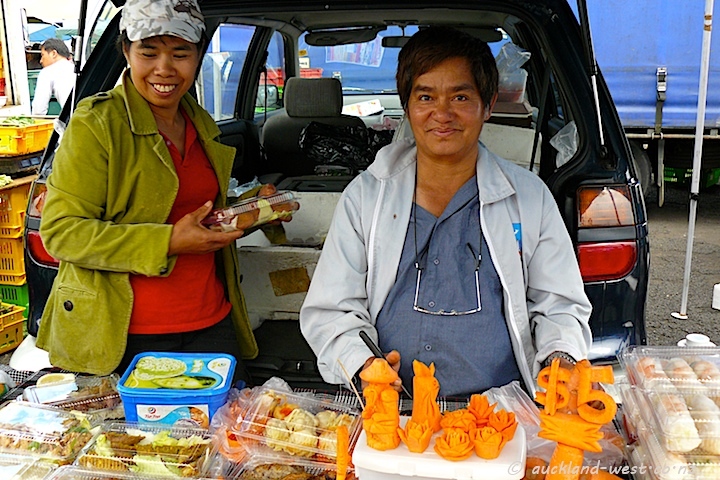 On our visit yesterday, I took this picture of a very talented vegetable carver with his wares. 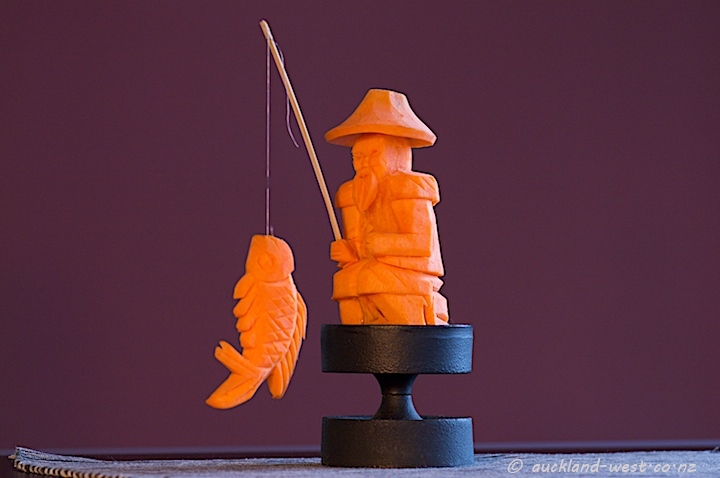 I also had to have his carving of a fisherman. This took pride of place on the dinner table in the evening, presiding over a fine meal with friends. Just admire the detail! Follow the link to a slideshow “Avondale in Pictures” which ran as part of the NZ Spinal Trust Charity Race Day on 19 September 2015. 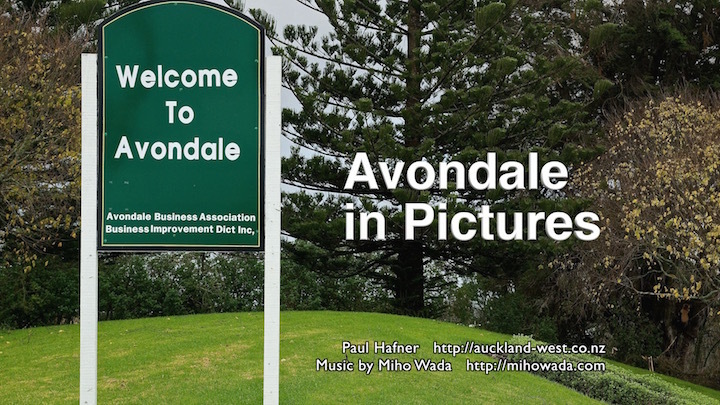 Showing 27 minutes of images – races, market, village, Rosebank, Whau etc – of Avondale as I captured it. With music by Miho Wada (by kind permission). 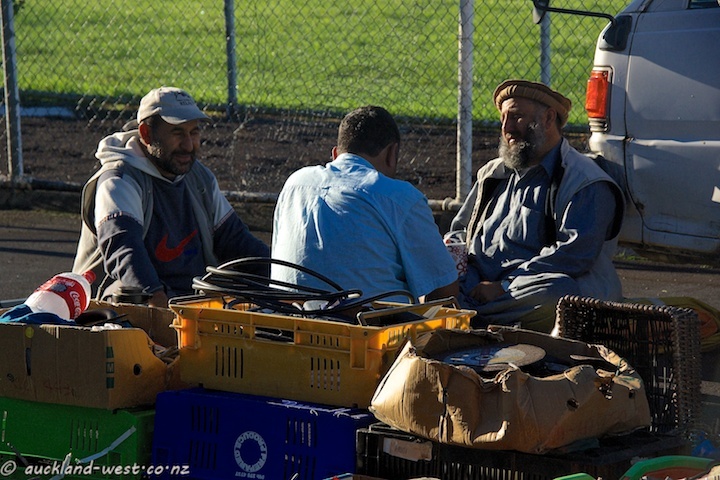 Early at the Avondale Sunday Market a trio of stallholders gather for a cup of coffee and a natter. 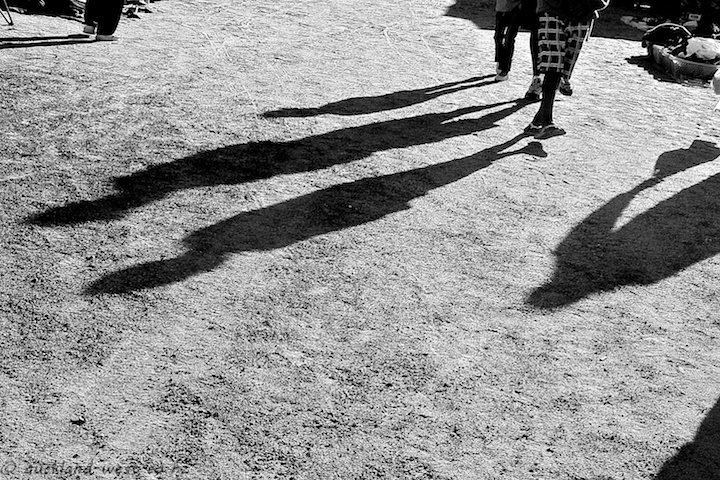 At the Avondale Sunday Market early in the morning. 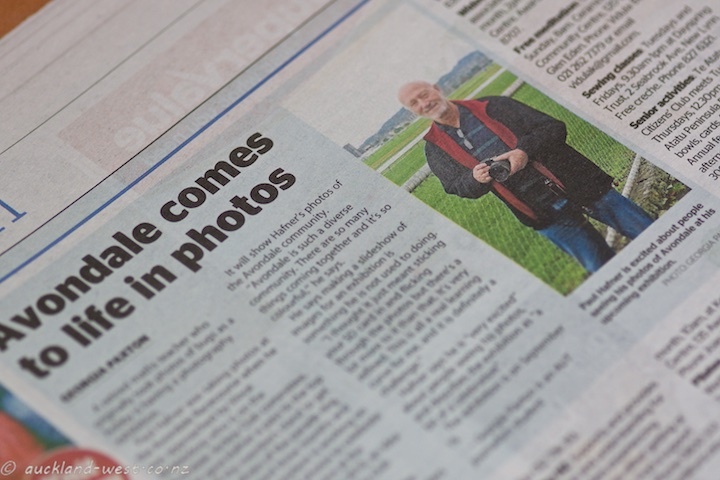 We had arranged to meet at 11 am at the Avondale Racecourse – not her usual haunt. Georgia is a communications student at AUT University, majoring in journalism. In a few weeks’ time she will graduate. 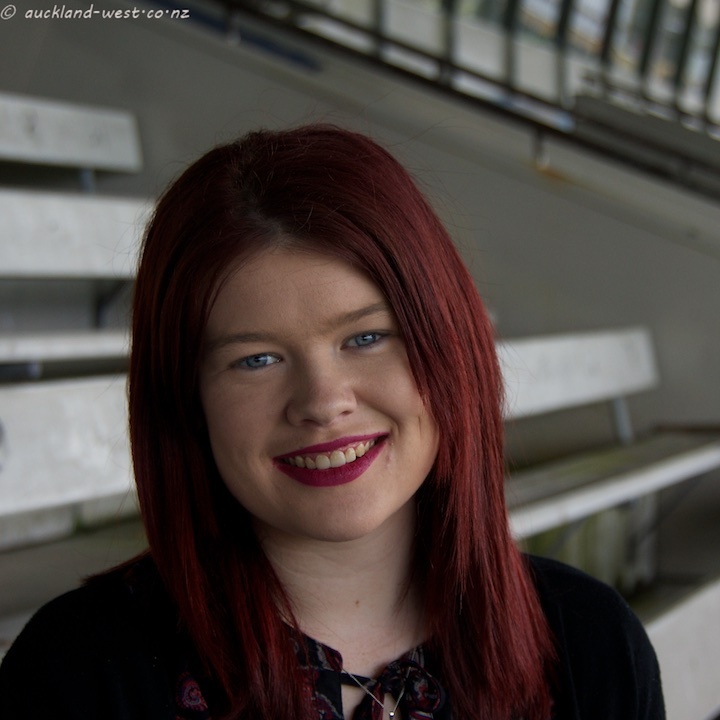 And recently she worked as an intern at our local rag, the Western Leader, where her byline appeared in a number of articles, providing practical insight into her future profession. I am sure she will be doing well. The interview was conducted at the highest level of the grandstand in full view of the expanse of the grounds. Well prepared with questions, an engaging smile – it was a pleasure to be interviewed by her. And yesterday her article appeared. 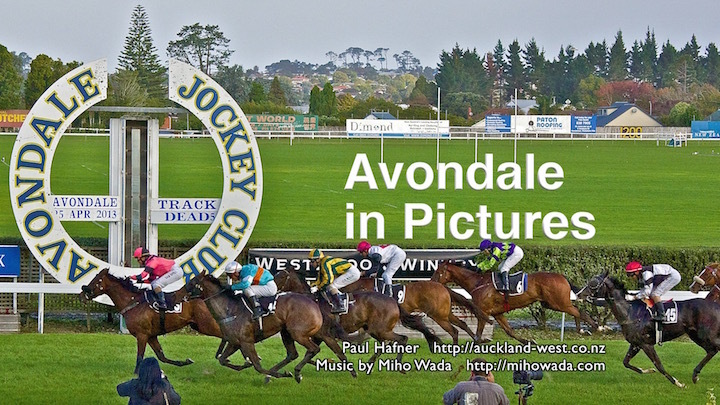 The Avondale Jockey Club had invited me to show a slideshow “Avondale in Pictures” this coming Saturday, 19 September: their first Saturday race meeting after five years (a charity event for the NZ Spinal Trust). An interesting exercise, and I am looking forward to it. 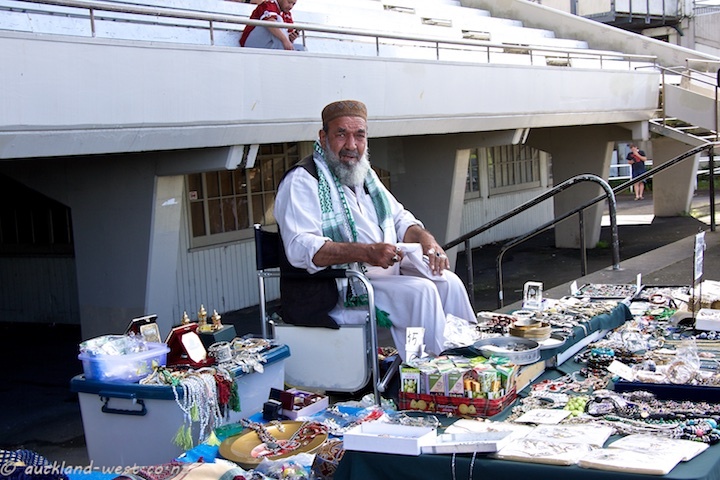 Pictures of races, the Avondale Market, the village, the Rosebank Peninsula – something for everyone in a continuous loop running all afternoon in the ground floor foyer of the members stand.